Herky explores his feelings in this short video. A mascot’s place most commonly is on the sidelines. At Sacramento State, where Herky the Hornet reigns, it is anything but. Across his 70 years, Herky’s role has evolved into one that puts him front and center. And don’t disparage the University’s well-toned totem to the boss. “Herky is my hero,” says University President Robert S. Nelsen, perhaps his No. 1 fan. How Herky got his name is murky, but it’s established that the moniker is a colloquialism for the full name “Hercules” that was bestowed soon after the hornet was selected over the elk as the campus mascot on Dec. 5, 1947. With his now-familiar hulking physique, Herky is well equipped to carry the banner for the University. “He’s a hallmark to our campus and community,” Marketing Professor Tim Howard says. For many years, such was not the case. Upon Primas’s arrival on campus, Herky’s look – it has had more than a couple of less-than-intimidating iterations – “needed updating.” So one of Primas’s first tasks was to call on Alinco Costumes, the nation’s leading mascot outfitter and designer, to bring more heft to Herky in the 21st century. Howard says the 70-year history creates community capital. Generations of people, from the University’s Golden Grads to Howard’s adolescent children who have grown up going to events with their dad, have an emotional connection to Herky. 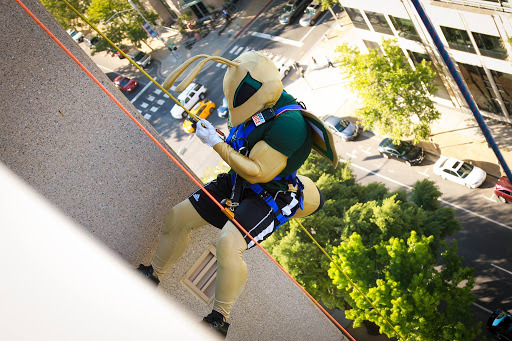 “When he’s out there (in the community), he is exemplifying Sacramento State’s excellence,” says Howard, who points to several advantages of having a strong mascot on the front lines of University relations. For one, they don’t get in trouble – or if they do, at least it happens anonymously. Not to be dismissed is cost. A good-to-great mascot can go a long way toward furthering an organization’s messaging, Howard says, and they are far less expensive than ad campaigns. “If you look at a return on investment, a mascot can be a tremendous complement to your organization’s reputation and brand,” he says. It can be a weighty responsibility. The appearances at ribbon cuttings and groundbreakings, Homecoming tailgates and donor dining events, to say nothing of sporting events, all happen on the, ahem, Herculean strength of two full-time marketing staffers in Athletics (Primas included), six student employees and two people Primas describes as “casual hires” for game-day duties. Many large universities offer mascot scholarships, but Sac State relies on volunteers. Primas has tried advertising the Herky position, but he finds that “uncomfortable.” One year he worked through the cheer team, hoping that outfit’s members could recommend someone who didn’t make the cheerleading cut or knew someone with mascot experience. Last year, new hope arrived thanks to just such luck. At the end of a five-minute presentation Athletics is granted at freshman orientations, Primas announced he had “one more thing.” A person who had filled the Herky role had graduated. He needed a hero. A shout came from the back of the room. A few seconds pass, a voice on the other end answers, and we’re as close as almost anyone gets to peering under the antennaed headgear, considering that the identities of the humans who bring Herky to life are not made public. The freshman (now sophomore) who spoke up from the back of the room says that the minimally compensated job of playing Herky – which is shared with one other student – consumes much of his time, but that he loves it. He describes wearing the suit as gaining a super power. “When I’m in the suit I feel like a Power Ranger,” he says. Much goes into bringing Herky to life. Requests for his presence often exceed resources. Now that he’s so in demand, finding the time can be tricky. And Herky never works alone. Someone has to serve as a handler to fill tasks such as making sure kids don’t tug his stinger and reading hand signals when Herky needs water. “It’s difficult to find someone who can understand you when you can’t even talk,” Herky says. Primas compares Herky’s mental and physical preparation to that of an NFL player. He’s always thinking of things he can do when in persona. “He’s gonna be one of our best,” Primas says of the current Herky. Wearing the suit also, of course, requires living a double life of sorts. Inside, you’re a muted superhero, the big man on campus to whom people call out across the Main Quad, and the subject of a thousand selfies. Outside of it, our Herky is just another student, though he overhears stories of the joy he brings to people in his role. And that’s gratifying enough, he says. “Herky’s me, and I’m Herky,” he says. As the process stands, it takes luck just to find that lucky charm. And although Primas effuses about the long-term prospects for this Herky, who he says would have won out even among dozens of competitors, it would mean so much not to count on luck. He and Howard separately stress what a difference it would make to have a mascot scholarship available. Howard, who describes himself as a “big-time advocate for the student experience,” says having four or five Herkys would be ideal. Scholarships would allow them to attend mascot camps, which would make an already strong icon that much stronger. But there’s still plenty of buzz.